Explore the highlights of southern Kyoto in a half-day tour! We had only one day in Kyoto so we booked the half-day tour to make the most of it. 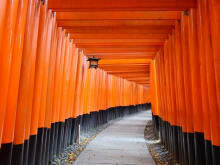 The guide, a very pleasant and informed man, was fluent in English and knowledgeable in Japanese history and traditions. He took us to see some of the most precious gems in Kyoto: the Tenryuji Temple with the Arashiyama Bamboo Groves, the Golden Pavillion, and the Fushimi Inari Shrine. All of these places were truly magical! We were picked up at our hotel and dropped off at the International Manga Museum – since our guide had learned that my son was a keen manga reader. Perfect service indeed!